Bricanyl inhalers, syrup, tablets and respules (nebuliser solution) all contain the active ingredient terbutaline. Terbutaline causes the muscles in the airways to relax. This allows the airways to open which makes breathing easier. Bricanyl is a prescription-only medicine. 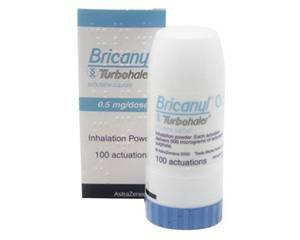 Bricanyl is used to treat asthma and chronic obstructive pulmonary disease (COPD). Common symptoms of these conditions include (episodes of) chest tightness, shortage of breath, and coughing. These symptoms are caused by a narrowing of the airways in response to triggers such as cold air, smoke, exercise or allergens. By opening the airways, Bricanyl makes it easier to breathe. Bricanyl relieves wheezing and chest tightness instantly and its effect should last around six hours. Bricanyl is available in various forms. The tablets and syrup can be taken with or without food. The inhaler (turbuhaler) and respules contain medicine that should be inhaled. The turbuhaler is a dry powder inhaler. It contains the medicine in powder form ready for you to breathe in. The respules contain liquid medicine that is broken down into small droplets. This mist is inhaled from the mouthpiece (aerochamber) of a drug delivery device called a nebuliser. You can find instructions on how to use Bricanyl in the package leaflet. Bricanyl respules (5 mg/2 ml): open one respule by twisting the top and squeeze the contents into the nebuliser. Repeat if necessary. Children may need to be given an adjusted dose. Always follow the prescribed dosage and read the package leaflet closely before use. Most side effects are usually only temporary and will disappear once the body adjusts to the medicine. Consult a doctor if the side effects are severe or persistent. For more information, see the package leaflet. You have a heart disease (ask your doctor for more information). Consult your doctor if you have an overactive thyroid gland or health condition such as diabetes or epilepsy. Bricanyl is known to interact with some medicines. It is therefore important to tell the doctor what medicines you are already taking to make sure the combination is safe. Bricanyl should not be used by pregnant or breastfeeding women without consulting a doctor first. In principle, this product does not affect your reaction time. If you feel unwell you should stay out of traffic. Bricanyl does not interact with alcohol.